The in-car DAB/DAB+ radio adapter that works seamlessly with your existing car audio system. Bringing you more stations, more choice in crystal clear quality. Both simple to install and use, this adapter blends into any dashboard with effortless style and convenience. Our Highway in-car audio adapters are the easiest way to update the existing audio system in your car, van or truck without replacing it. Enjoy the great choice of stations and interference-free quality of DAB/DAB+ digital radio, plus all your favourite music from your phone, tablet or music services using the integrated aux-in cable. Whether you’re new to digital radio or already enjoy the great choice and quality of digital radio at home you’ll love listening in your car with Highway 200. DAB digital radio brings you high-detail digital-quality sound, great content, much of which is only available on digital radio. Digital radios automatically find all your available stations and let you select them by name. Highway 200 is also Digital Tick approved so you can rest assured that you’re ready for any future FM to digital radio switchover. Designed as an easy-fit solution for the millions of vehicles on the road worldwide without digital radio. You’ll find Highway 200 easy to install in your car, you won’t even need any special tools, just a few simple steps and you’ll be up and running. Highway works with your existing audio system using the supplied line-out cable or by transmitting over an unused FM frequency. Composing of a compact, stylish controller that can be fixed just about anywhere on your dashboard, and a discreet windscreen aerial and antenna, there’s never been an easier way to enjoy digital radio and music from your phone in your car. Highway 200 comes fully equipped with service following capabilities, helping to reduce potential drop-outs and maintain consistent reception from one journey to the next. With the ability to automatically switch over to the strongest available transmission in any area, Highway provides a more reliable and seamless listening experience, without having to retune. Simply connect your phone, tablet or music player via the supplied 3.5mm line-in connector, then sit back and relax as you listen to music, audiobooks or podcasts safely as you drive. The large auto-dimming display and easy-to-read backlit buttons, make operating Highway a pleasurable experience and ensure your attention is fully focused on the road. Selecting stations and navigating through menus is swift and intuitive, along with the added convenience of storing up to 20 presets, access to your favourite stations is always a breeze. Like all our products, Highway 200 was designed and engineered in the UK by our expert engineering teams. This not only ensures great sound and impressive build quality, but allows us to offer the reassurance of a three year warranty as standard. How long does it take to fit the Highway 200? It can depend from user to user however we expect an average of around 15mins. Will it interfere with Sat Navs or any other devices I use the 12v power socket for? Our power adapters come with two USB ports so you can either charge your phone or plug in your Sat Nav at the same time, whilst powering your Highway. Can I listen to music from my mobile through the cars audio system? 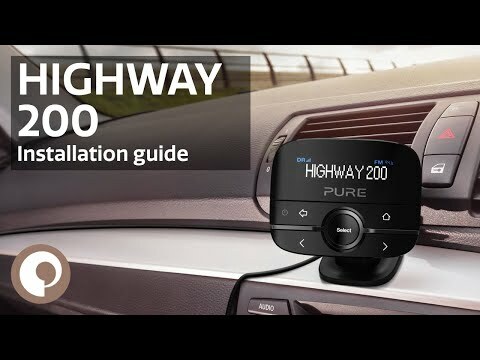 Yes, Highway 200 includes an auxiliary input so you can connect your mobile or table device and listen to your favourite music or streaming service. Can I use an alternative aerial with my Highway 200? The Highway 200 comes included with an antenna and film aerial, but can also be used with alternative aerials that use the SMB type connector. If you're looking for further support for your product, please visit our support site. How do I install the Highway?